I am seriously possessed by color. I think about it all the time. 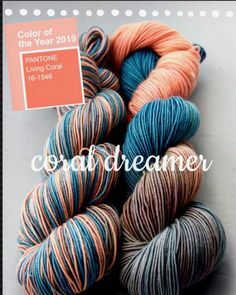 Last year when we were dyeing massive amounts of shaded solids on our Cake DK base for Carol Feller’s Camira KAL I had a color idea. What sparked this idea was the amount of grey we were dyeing. 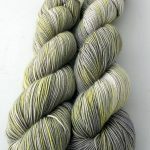 So many knitters order grey!! And fair enough, its a great neutral and looks pretty great on most of us. I wear tons of grey with a little black thrown in for good measure. hehehe! 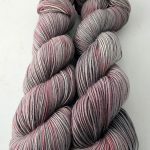 We have quite a few greys also, from our dark Deep Unrelenting Grey to our very, very pale Winter Solstice. I got to thinking how nice it would be to have greys that had just a hint ( tint ) of another color to them. Wouldn’t that just make the most stunning garment. 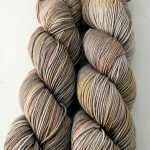 The color would be mostly grey but with swirls of “other” color through the grey. Just enough color to be visible but not enough to take over where you could not see the grey. One of those fine color lines! It’s taken almost a full year to make to where I was happy with that fine line! And I am. Also pretty excited to add to our coven! So why The Coven and wild witchy women? Well… first of all, I have a thing for magic and witches. My grandmother was the witchiest woman I knew so I can dedicating these to my Winnie. And yes, there will be a Winnie in our Coven I have just not settled on her tint yet. She would so love that I had not settled on her tint. I can hear her now…cackling away at the idea of making her a color. She had the best cackle ever! I think it was a combo of the Maxwell House all day long with a little Jack Daniels thrown in after 3 and the non filter Camel cigarettes. Boy do I miss her. Maybe a coffee colored tint. Hmm… . Anyway…I see our Coven being good for just about any knitting whatsoever. Where I really see casting there subtle spells is in garments, especially. 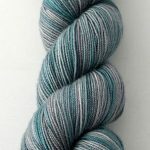 So many sweater patterns out there that these would be so beautiful. It’s almost like a, “you can have your cake and eat it too” moment. Since you can have your grey but with a little color peaking through. I’m pretty tickled with these. 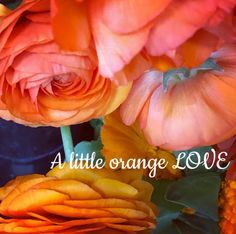 I hope you love them! If you have any witch names or ideas I would love to hear them! 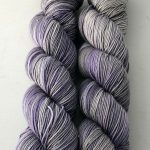 The picture above is our annual Rhinebeck 2018 colorway. 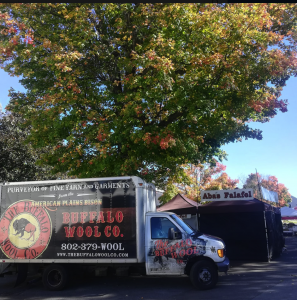 That colorway and so many more are there with the lovely and delightful Theresa and Ron Miskin at The Buffalo Wool Co. so do stop by. 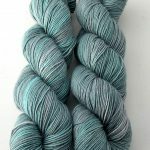 Carol Feller is dropping off her Tangential Blue Pullover for all to see and fondle and they have lots of Targhee Worsted! Cast-on is next weekend!! Their booth is over by the souvenir shop and 2 story barn. 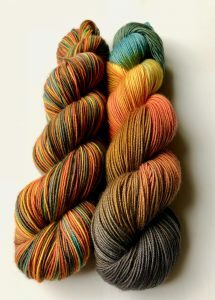 22D/OD22-01 Also seriously check out their socks and the cowgirl colorways I dyed for them on 2 of their lovely yarns! So much goodness! Everyone have fun!!! For those of us with the Rhineck blues because we can’t make it there. 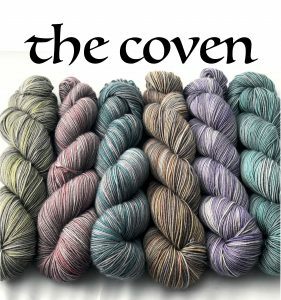 We have The Coven and the Rhinebeck colorway is up on our website along with this new Halloween Color and a 10% discount that is good for the weekend! Just use code: rhinebeckblues18 when you check out! All loser case. Hocus Pocus!! It is the 25th Anniversary of the Halloween classic Hocus Pocus so of course we had to celebrate that with a witchy tribute those wacky Sanderson sisters!! Okay my lovelies I have to go pack and ship Moon Shadow Anniversary packages! Package up Our of the Hue and edit the last part and dye and clean the chicken coop and maybe the house a bit. Valla my very long haired Norwegian Forest cat is shedding and there are big clumps of cat hair everywhere!!! I know I should not say this out loud because it will most probably jinx it but next week we are going to be caught up in a way that will let me sleep at night!!! Again thank you so much for your patience!! I have a lot to say about our industry changes that are happening and coming our way so stay tuned for that! 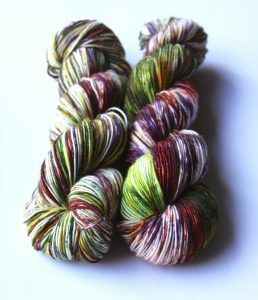 What I can advise is that now is not the time for stash busting. It is the time for stash enhancing! Oh I almost forgot! How could I forget! I met the new neighbors last night. I was driving down the drive and they had a fire going and were roasting hotdogs and marshmallows. I know. The have 2 adorable and friendly pooches and…( wait for it) she is a KNITTER!!! Yes! Happy dancing! They want fiber animals and we had a great chat and I am so very,very, very thankful! Thank you for all the good vibes you sent my way!